Take a moment and look at outdoor. How beautiful it is to see the dew drops on the spiky green grass, the sound of chickadees chirping in their nests, and the beams of sunlight shining through the canopy of trees. At least that is what I see when I look outside my kitchen window. As I observe the nature of the woods, it reminds me of the beautiful backdrop I had during the Team Flower Workshop farewell dinner reception... and what a finale it was! Kelly Perry, the organizer, called it the Flight of Butterflies themed dinner as it was inspired by the film. The table setting highlighted the colors of the monarch butterfly along with spring elements that complemented the color palette. Oh, how I loved the soft creamy colors of the roses and daffodils flowing out of the garden-style arrangements... and those bold accents of golden orange roses tucked deep within the design not to mention the airy wands of blue jewel-toned flowers at the tops. Each elegant navy blue place setting had a delicate monarch butterfly attached to represent each attendee. Kelly discussed that while we as individuals are small and fragile in the grand scheme of things, we are also so strong. She explained that monarchs are known as the largest known insect migration in the world and travel thousands and thousands of miles from Canada to Mexico annually. While they fly alone most of the time, they bump into one another during their journey. Finally, when they get to their special destination in Mexico they remain together in the thousands. What a beautiful symbol she had used to describe our journey as floral designers, at one point feeling alone, doing our own thing, and then finally meeting one another at Team Flower Workshop and seeming so strong as a community. I am happy to say that my feeling of community with the girls has grown since that dinner a year ago. And, I can still remember every detail in the table setting and taste of the food catered by Savory Thyme Cafe up to that delicious layered piece of cake with a delicate pansy showing off on top of sprinkled nuts. 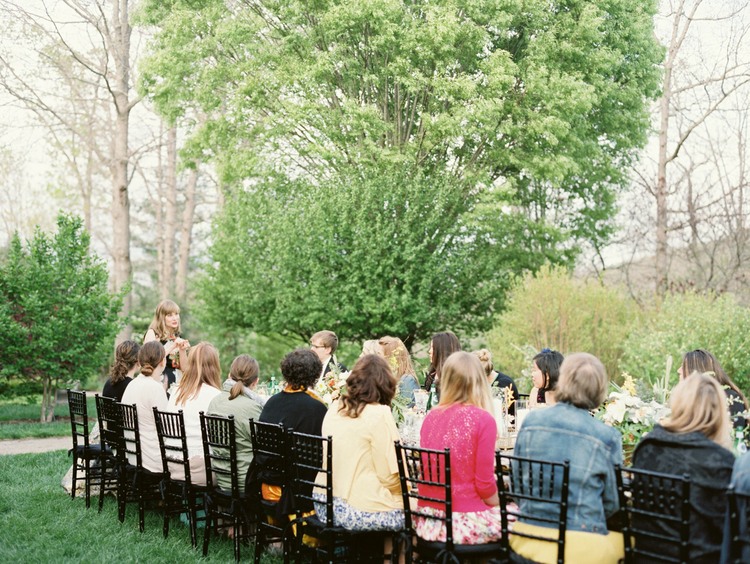 You just have to take a look at the farewell dinner photos captured by Holly Carlisle to truly see the beauty in the group, dinner, and setting. It was an evening and experience to remember. For more details about Team Flower Workshop or about the inspiration for the dinner, visit Team Flower.